Nancy Pelosi suggested in a new interview that Republican leaders in Congress would not support another partial government shutdown over border security funding demanded by US President Donald Trump. “I have a club that I started, it’s called the ‘Too Hot to Handle Club.’ And this is a too-hot-to-handle issue,” Pelosi said. She said she believes that a House-Senate panel negotiating on border security will come to an agreement before the deadline. Pelosi also indicated that she would support any deal that these talks would produce. 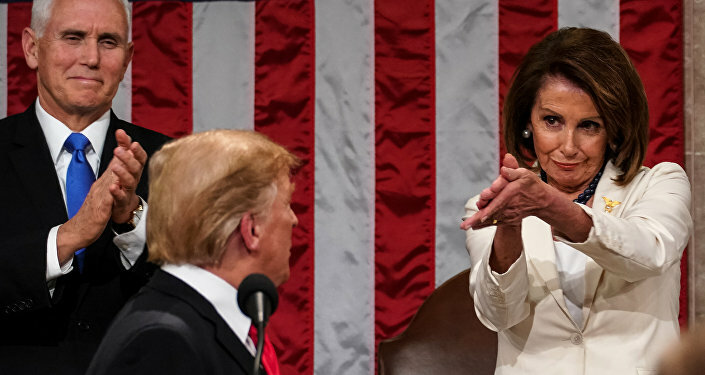 Pelosi also took aim at Trump's State of the Union address late Tuesday, where she was spotted sarcastically clapping at the president. She said that while she respects the office Trump holds — and prays for him daily – she believes that Trump’s speech was “theatrics” and “not government”. She also dismissed Trump’s criticism of House Intelligence Committee Chairman Adam Schiff, who is a close Pelosi ally. The shutdown was caused by the Democrats’ refusal to approve Trump’s demand of $5.7 billion in spending on southern border security, which included building a barrier. The US President agreed to reopen the government and sign temporary budget funding for government agencies through February 15.